Price: 6€ + Shipping Fees (4€ Digital Release). After many years releasing online music under Creative Commons Licenses we finally decided to go physical. This happens after being so confident that Audiotalaia has become much more than a netlabel and we still have a lot to offer. 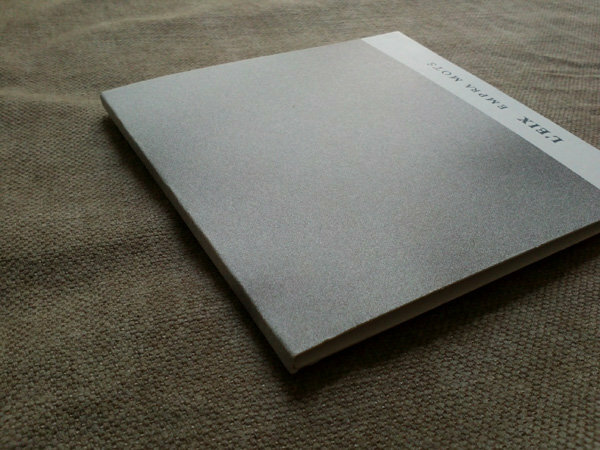 We start this new adventure with the outstanding quality of the artists delivering the first physical edition in Audiotalaia: L’Eix’s “Empra Mots”. L’Eix (“The Axis” in Catalan language) is a Barcelona based ensemble founded by internationally acclaimed improv & experimental guitarist and sound artist Ferran Fages and electronic music producer and critic Oriol Rosell. L’Eix’s third member, although not a “sounding” one, is Julià Carboneras, who is in charge of developing specific interactive devices for the trio live concerts. But beyond the different and well known characters forming it, L’Eix is not a joint venture, nor a “project”. L’Eix is a band in its most traditional sense. A group unit producing songs from an experimental point of view. 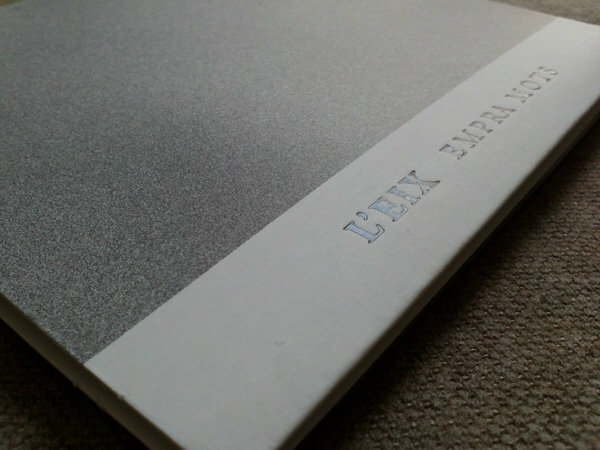 Far from experimental music’s usual gimmicks, L’Eix seeks to establish a work flow mixing its members’ background on experimental philosophy and practice and their love and open ears towards other kinds of music. In that sense, L’Eix is a constant dialogue between disciplines, languages and ways to understand sound and music under the song-composing condition. The very structure of the tracklist on “Empra Mots”, the addition of a Re-do album as a download gift involving a long array of friends and collaborators, from classical players to poets to pop musicians and IDM producers— and even some not-so-inside jokes... all of these help show that L’Eix is looking forward to generating both discussion and complicities within the sonic arts. But, above all that, they want to make great, memorable songs. “Empra Mots” is a listening experience that drifts between pop, folk and experimental minimalism flirting with various genres and styles, wrapped in a subjacent, extremely ironic sense of humour based on the trio members’ condition as Catalan speakers. A very unique record brought to you by a no less unique label. Clean, simple acoustic guitar melodies combine with various electronic buzzes, hums and wooshes across the album’s eight tracks, a basic but nonetheless effective formula. At times the interactions between guitar and electronics lack sufficient complexity or subtlety to keep me interested; my favourite track, album closer “Barjaules, Barralers i Enredaires”, is also the most developed in terms of structure and establishing a sense of musical cohesion. However, the general feel is relaxed and playful, reminding me a little of Japanese ensemble Minamo, which is no bad thing at all. Presumably many of the electronic sounds came from devices made by Carboneras; if so, it would have been nice to find out more about them, perhaps through a video included in the gift download. Wait a minute, “gift download”? Ah yes, this is “Empra Mots”’s secret weapon: though released on CD, the album includes a gift download code for a collection of reworkings entitled “Refet”, in which six different artists take tracks from “Empra Mots” and present their own unique slant on them. There’s a variety of top-notch contributions here, from Kenneth Kirschner’s minimal piano interventions, to Sara Galán (of Cello + Laptop)’s lyrical cello melodies, to Eduard Escoffet’s rhythmically arresting spoken word delivery. Far from being a superfluous add-on, the album of reworks makes a good release even better, especially considering that “Empra Mots” itself is somewhat on the short side. An interesting package, then, and well worth checking out. Cuando L'eix comenzaba a dar sus primeros pasos hace un par de años, Oriol Rossell confesó en estas mismas páginas que al juntarse con Ferran Fages su intención era la de “hacer canciones, me atrevería a decir que canciones bonitas”. Una declaración que en aquel momento cuando sólo era posible escuchar un puñado de cortes rasposos colgados en un Soundcloud podía sonar a boutade, pero que con la cuidada edición de “Empra mots" entre las manos cobra todo el sentido del mundo. Ocho cortes que siguen plegados a la misma fórmula: Fages aporta sencillas lineas de guitarra acústica. breves apuntes melódicos que resuenan como sedimentos de canciones perdidas en la memoria (importa tanto lo que toca como lo que calla, es decir). y Rossell envuelve todo con un manto de zumbidos digitales de reverberaciones y cruiidos ocasionales que reaccionan ante los movimientos de la guitarra. Y digo que reaccionan porque se nota que existen estructuras ocultas en el fondo de la mezcla; se nota que existe una voluntad narrativa. que añade una pátina de calidez a la música. A una música cruda y abstracta en la superficie, pero que en el fondo gasta un corazón sensible. Un segundo disco, con estupendas remezclas a cargo de amigotes como Árbol, Kenneth Kirschner, Refree o Sara Galán, redondea un debut mucho más que notable. Vuit temes d'experimental calmat, de força acústica on la guitarra explora nous llenguatges amb l'electrònica i el sorollisme. Strange name might confuse, but the name of one of the three members of the band is widely known in narrow circles of fans of modern Improv - it Ferrand Fazhes (Ferran Fages). Here, he plays the acoustic guitar, by the way, usually Fazhes played on this instrument solo, and not in collaborations. 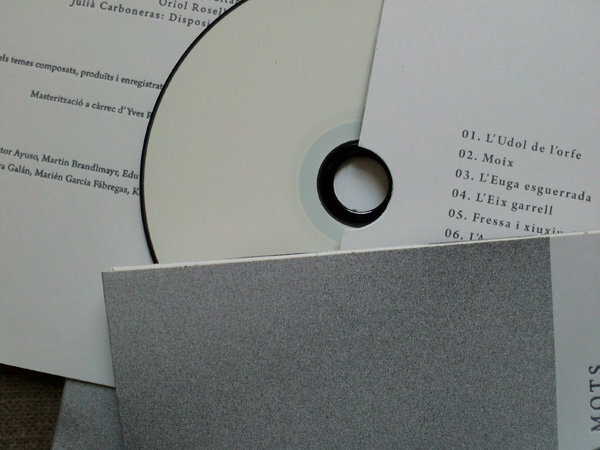 The other two members were unknown to me until this disc: Oriol Rosell (Oriol Rosell) uses electronics and Julia Carboneras (Julià Carboneras) - interactive devices. It is difficult to say what exactly is meant by these things: both on stage (yes, Julia - this is a man's name) standing with laptops and they gaze wistfully. At first sight it may seem that Fazhes pulls the blanket over himself. However, this is not the case. Yes, of course, that the acoustic instrument is more mobile and agile in improvised music. Ferrand has a very musical and it instantly reminds himself he is on solo albums, where a melancholic mood as if forcing him to play sparingly and with long pauses. Ambient, you say? Not at all. Ferrand one of those musicians who can play sometimes banal prettiness, perfect getting into a serious and highly abstruse almost context. So in this trio of electronic engineers build oppressive or crackling canvas, and the acoustic guitar that follows them, it plays as if in defiance, but in both cases the right and manages to find the right combination of electronic timbres. Often becomes clear, for anyone who is going. In this case, they both follow exactly where they need that confidence is felt throughout the album. This is important because without it the quality of the canvas immediately be broken up into two parts: on the one hand, speakers, on the other electronics. At this need to focus, it's not so often manage to find that balance, without falling into the girl's ambient noise or very radical. Spanish trio musically, this property is inherent even in electronics. And another important point - the trio works with small forms, managing for 3-5 minutes to tell the full story. And there are stories on the drive eight. L’EIX is an electro-acoustic trio based in Barcelona. 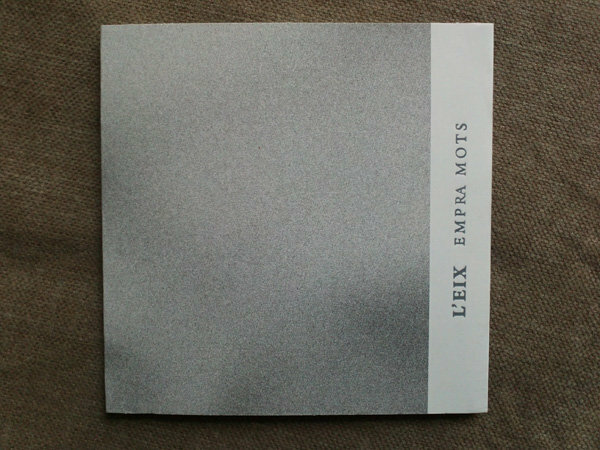 On their debut record, Empra Mots (which only features 2/3 of the trio contributing), L’EIX prudently cross lush, dreamy acoustic guitar passages with electronic soundscapes in an unobtrusive fashion. Empra Mots is a minimal affair in which space and stasis are integral to the atmosphere constructed on each piece. The acoustic guitar, for most of this record, is played with a focus on simple melodies and chord voicing’s. Guitarist Ferran Fages supplements this simplicity though with free-form rhythms and dynamics that are determined by gesture. Opposite member, Orio Rossell, counters Fages pastoral guitar passages with electronic textures that fluctuate from being sparse crackles, clicks, stutters and pops to dense low frequencies that pulsate and drone at the bottom of the mix. 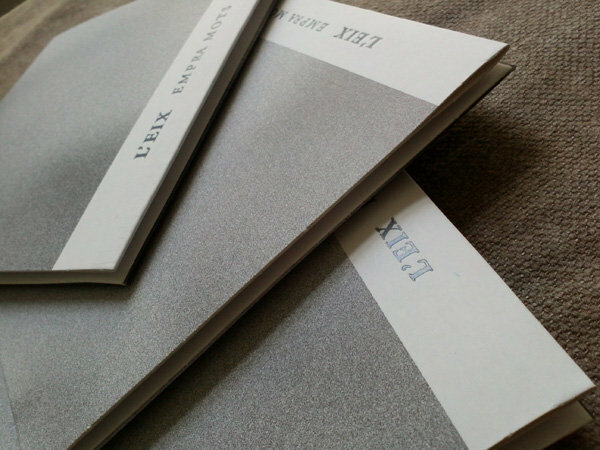 L’EIX’s Empra Mots is neatly crafted and well executed. Both artists have a clear conceptual underpinning when creating music and it is exemplified readily throughout the album with conviction and honesty. L'Eix formen un curiós trio que vol entendre's post-rockero. però que en realitat sona més «post» que "rock". No es tracta del rock dens i resposat amb textures gruixudes que tots tenim en ment sino més aviat ?una amalgama de sons heteris, electrònica lleugera, turisme experimental y atmosferes filmiques. Diu Oriol Rossell: "La improvisació va ser capdal quan vàrem començar, el dia que vam trobar-nos per veure què passava quan tocàvem jur?ts. Però es va imposar un mètode de composició més relaxat: el Ferran m'envia una frase de guitarra i a partir ?allà es construeix el tema “. Aixi sona la seva carta de presentació, "Empra Mots”. toti que res millor que el seu hipnotic directe per gaudir de L'Eix. “ Volem arribar a gent que potser mai ha escoltat aquest tipus de música. però a la que estem convençuts que podem agradar". Empra Mots by L'Eix (Fages, Rosell, Carboneras) is licensed under a Creative Commons Reconocimiento-NoComercial-CompartirIgual 3.0 Unported License. Creado a partir de la obra en http://audiotalaia.bandcamp.com/album/atp003-empra-mots.